Any Fairy Tail related stuff can be posted here. dude have u been reading the manga o.o epic!!! and what is zerefs relation with natsu? (2011-09-05, 11:45 PM)Dark_Flamez Wrote: dude have u been reading the manga o.o epic!!! and what is zerefs relation with natsu? Yes I have and idk. Don't really watch this ._. I think his relationship has something to do with the early days like around when Natsu joined Fairy Tail? Iunno, but there was a page about that, I think in the recent chapters. Meh. Zeref is a dragon slayer. I hate Acknowlogia or whatever its name is. Did everyone die or something? Is it the artist's way of telling us that he's going to go with a new arc/storyline/characters? MY .. My Picture is Pwnage ! (2011-10-08, 11:59 PM)Dark_Flamez Wrote: i would cry!!! Lucy, Happy, Charla, Black Cat (forgot his name), Natsu, Erza, Wendy. I may have to start paying attention to this for the heck of it. just to follow with you guys and be able to not post like an ignoramus. next to the reply button and to the right of the report button.you click it on more than one post to qoute multiple ones at the same time. I now have to watch the new ep of Fairy Tail. 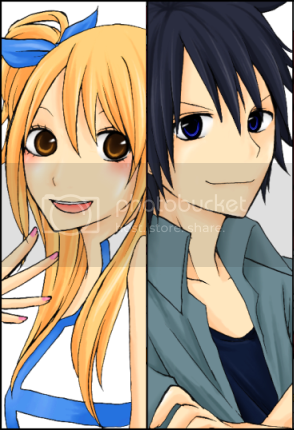 I read the manga of January 6, 2012 and.. I love Fairy Tail ;-; Best Anime ever.